“I’m a Writer”: Essays on the Writing Marathon and Why We Write, an anthology by Southeastern Louisiana Writing Project teachers, addresses two connected subjects: the “New Orleans style” writing marathon that has caught on at National Writing Project sites across the country, and why writers write. In a New Orleans style writing marathon, small groups write and share their writing as they traverse a landscape, observing the world around them over a period of time that can range from an hour to three days. As this volume demonstrates, adults, children, NWP sites, classes, writers’ camps, and even community organizations can benefit from writing marathons. All a writing marathon requires is a group of individuals who want to write for themselves yet are willing to spend some time doing it together while following a few basic guidelines. These essays by teachers who have organized writing marathons tell the stories of their experiences. They offer useful, practical advice on topics including the role of the leader, preparations, guidelines, handouts, tips, and do’s/don’ts for achieving a successful writing marathon in virtually any situation. For teachers considering bringing the writing marathon experience into their own classroom (or life), this book can be a starting point, a resource for materials, and a helpful troubleshooting guide. While it offers direction, it is also meant to foster a dialogue about marathoning, to raise questions, and to further future discussion about the possibilities for writing marathons. 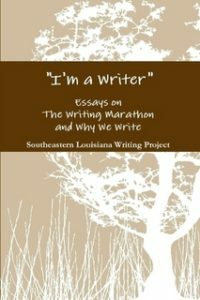 In the second half of this anthology, teachers of writing—all of whom have led or participated in writing marathons and several of whom describe their marathon experience in the first half—address an underlying question: Why write? One of the assumptions behind the Writing Project is that writing teachers should write; here, teacher-writers discuss why they write and how their experiences as writers impact their writing classes. Whether you are looking for a new, proven way to turn your students on to writing or wondering how to make the act of writing more authentic for yourself and your students, this book has something valuable to offer from fellow teachers and writers.